Eight-week program that consists of weekly 45-minutes classes. Mixed age classes, from birth through 6 y.o. 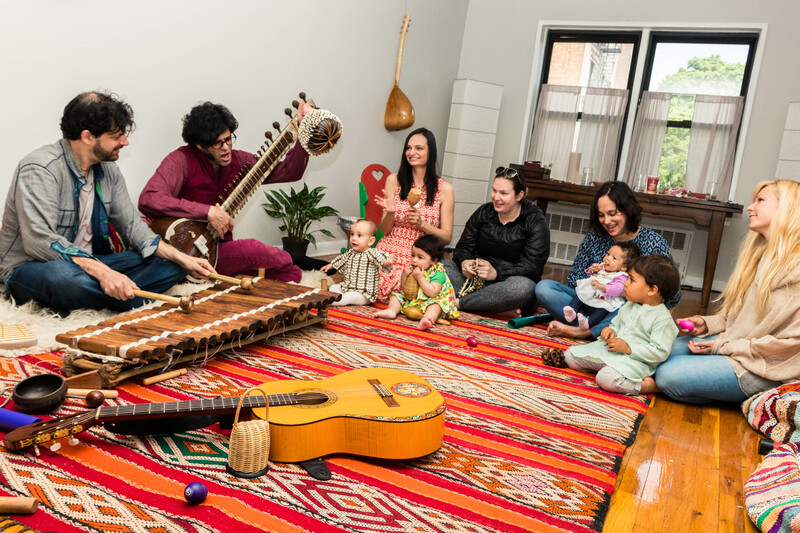 The classes are structured as an engaging and developmentally appropriate musical experience, exposing the child to the rhythms and melodies of diverse cultures. Each class is led by world-class musicians who are steeped in various musical traditions. Sign up for our 8 week World Music Immersion Fall Semester, or single class drop-ins! Although drop ins are available, we highly recommend that parents sign up for the whole course to achieve the best developmental results for their children. Throughout the 8 weeks they will become familiar with their peers, as their minds expand from absorbing the native rhythms and melodies of various cultures. Reach out to info@worldmusiceducation.org to inquire about trial classes. *Only pre-registered families are eligible for discounts. Drop ins are not eligible for discounts. Should you choose to cancel before or after your first class, tuition fees are 100% refundable. After attending two classes, 50% of tuition fees will be refunded for remaining unattended classes. Make-up classes are available after you have attended two classes, though there are no refunds for missed classes. Make-up classes can be scheduled via email info@worldmusiceducation.org any time before the class. All make ups will be scheduled for the next semester.